Two words: cyborg Cinderella. 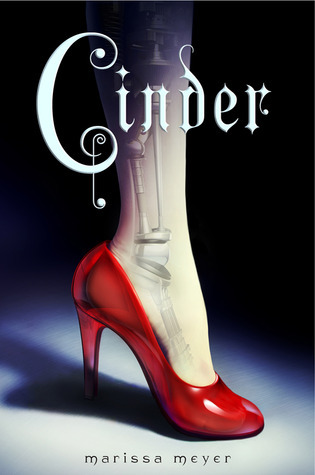 As soon as I heard that, I knew I'd be hooked on Marissa Meyer's CINDER. How deliciously sci-fi! Don't worry, I'm not giving anything away because you can pretty much assume this from the cover: Instead of losing a shoe, you can guess that she loses part of her leg. SO GOOD, RIGHT?!!? This YA definitely passes the test of crap-I-missed-my-train-stop-because-this-is-so-good. It amazes me how Marissa Meyer fit in so much worldbuilding in a relatively short book. This takes place in New Beijing after the Fourth World War, which was the war to end all wars--on Earth, at least. Now Earth faces the more technologically advanced Lunars, who can use magic to manipulate human minds. This may sound wild, but it fits so well with the Cinderella theme, trust me! Very clever and fresh, I'm obsessed. What about the love story, you ask? It's absolutely shiver-inducing. I am swept away by Prince Kai and I can't wait to see more of him in the sequel. Read this, I promise you'll like it! I already lent my copy to a friend, so this is obviously highly recommended. Everyone keeps telling me about this! Awesome find. Can't wait to read! Oh, and I hope you're feeling better!